In a private home not far from Toronto there have been many strange events happening since June of 2006. From noises to visions seen in the middle of the night to lights going on and off on their own. The general feeling of the house was uneasy. The house has three occupants, two men and one woman, all between the ages of 64-30. There is also a cat, he is a male tabby Eleven years of age and pretty happy and content. The house is a side split that dates back to the early 1970's. The land it was built on was a small path/walkway that lead from the street behind. It was originally meant to be a small pass though, but the plans changed and this house as well as the one behind it to the west was built and the pass through idea had been forgotten. The current owners have been there since 1996, and they are the second owners. When they moved in during 1996 there were three men and two women. Later on a third woman moved in during 2002 bringing the total occupants to six people. The family went through many changes over the past few years. Two of the women have since passed away. The eldest in the hospital of old age and the other in the home after a long fight with cancer. The odd events started happening after the death of the second lady in June of 2006. Floors creaking as if someone was walking down the hallway. Banging noises were heard a few times. And a basement light had been seen turning off and then on again not only by the people living there but by also a guest that had been visiting one night. A white figure was seen late one night in the bedroom that the death happened in and is now used by her grown child and his girlfriend. EVP's have turned up nothing. hundreds of pictures have turned up nothing.The cat has not reacted to anything. A second investigator from PSICAN was brought in and also found nothing. Some pictures turned up "orbs" and some odd lines, but when sent in for a more advanced look by an outside source turned out to be nothing as well. The above sounds like a pretty typical investigation that we would be asked to check out, and the investigation its self is pretty normal. right? I am writing this report for a reason. The reason is to point out to the general public as well as fellow investigators that mistakes are made and personal feelings can and DO in fact taint the facts. The facts in this case are: Floors do creak especially since carpet has just been removed to expose hardwood that is now exposed to air and is settling. Banging noises were in fact the furnace that does sound different from one floor to the other. The downstairs light turning off and on turned out to be a loose bulb and possible short in the wires. There is renovations being done in this part of the house. The white figure was most likely nothing but a fragment of a dream. The person seeing it was asleep at the time and only saw it once when turning over. How do I know all this ? It wasn't just my investigation, It is also my story and my house. 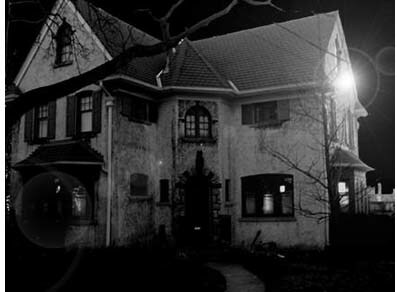 Sue's note: Far too often we hear of ghost reports made by those claiming to be investigators of the paranormal that include their own homes. In fact entire books have been written about the ghosts in people's basements free of any credible investigative efforts. Jennifer's report above underscores the absolute necessity of attempting to remain objective as emotions will be a factor when a personal residence is involved no matter who the investigator is or their background, and that outside neutral observers are imperative to any investigation if we are serious about finding actual causation to reportedly "haunting" events and not just adding to possible wishful thinking or over active imaginations. Excellent work Jennifer! It takes a lot of courage to come forward as publicly as you have in the name of proper research. Thank you. As for the image above, it is a photo taken of my favourite house down the road from the infamous Didier-Darroch compound. The house is actually quite lovely and inviting, however the image has been Photo-Shopped to death! It illustrates far greater than words, that appearances can often be deceptive, and in my opinion a perfect companion to this article.